So, here's how to can pickled watermelon rinds! The directions are complete with instructions in easy steps and completely illustrated. In the winter when you open a jar, the pickled watermelon rinds will taste MUCH better than any store-bought Canned Pickled Watermelon Rinds! The recipe is easy, but the you'll need to 2 days in total, as the rinds need to soak in brine for 3 to 4 hours, then are quickly cooked (10 minutes), then must rest in the fridge over night. Yield: About 4 or 5 pints. Step 1 -Wash the watermelon! I'm sure you can figure out how to scrub the watermelon in plain cold or lukewarm water using your hands or a vegetable brush. Make the brine by mixing the 3/4 cup salt with 3 quarts cold water. Stir well. Trim the pink flesh and outer green skin from thick watermelon rind. Cut into 1 inch squares or any shapes you desire. You only want the white portion. Of course, you can give the red parts to your kids to eat while you're cooking! And the red part makes great watermelon jelly! 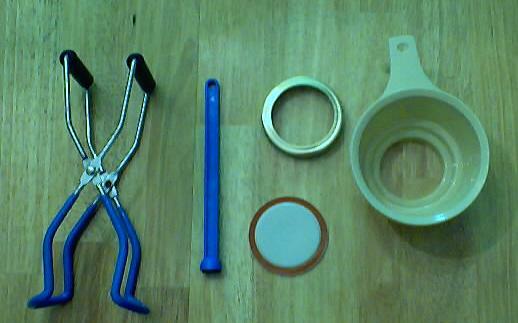 Cover with the brine solution from step 3. Add the 2 trays (2 quarts worth) of ice cubes. Let stand 3 to 4 hours* or overnight**. tied in a clean, thin, white cloth. I use a baby's ice lollipop bag (available at mall kitchen stores, Target and other local "big box" stores) as it is reusable and easy to use (see the photo). 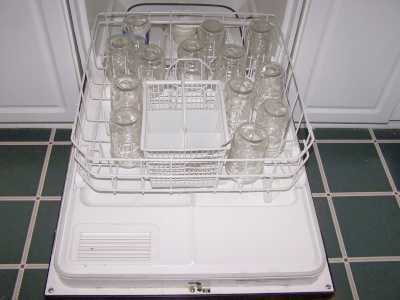 After the 3 to 4 hours minimum brining has elapsed, drain and then rinse in cold water and drain again. Cover the watermelon rind with cold water and cook until almost fork tender, about 10 minutes (do not overcook). Halfway through (after 5 minutes), add the sliced lemon. and the seasoning mix bag from step 6 in a large pot and boil for 5 minutes. Step 9 - Drain the watermelon rind and add to the seasoned syrup. Drain the watermelon rind and add to the seasoned syrup solution from the previous step (remove the syrup from heat). Let the watermelon rind and seasoned syrup stand overnight in the refrigerator. Step 12 - Heat and prepare to can! Heat the watermelon rind in syrup by bringing it to a boil. 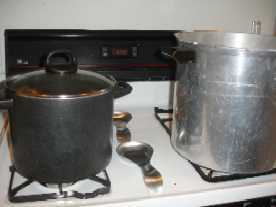 As soon as a boil is reached, turn down the heat to cook slowly for 1 hour. The chart below will help you determine the right processing time and pressure, if you have a different type of canner, or are above sea level. 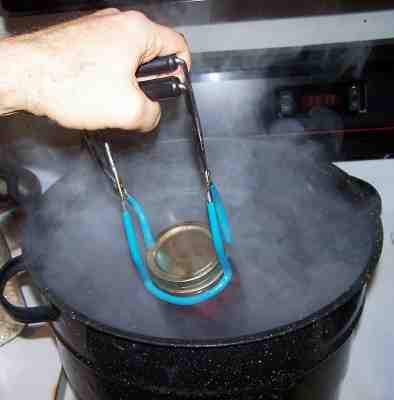 For most people, using a plain open water bath canner, the time will be 10 minutes. Process according to the recommendations below. Let cool, undisturbed, 12-24 hours and check for seals. Recommended process time for Watermelon Rind Pickles in a boiling-water (open, non-pressurized) canner. Q. Is it safe to can watermelon rind in a traditional water bath? If so how long do you do process them? A. Yes, PICKLED watermelon rind, the recipe above, has been tested and is very safe in a water bath canner.